The following email comes from a CMI supporter, Andrew B. of NSW, Australia, but one who has expressed his disagreement with us over whether there may be ‘errors’ in the Bible. In his first letter, he wrote in general terms, replying to a recent Prayer News article by CMI-Au’s Managing Director, Dr Carl Wieland, ‘Does the Bible contain human error?’. CMI-Au’s Andrew Lamb responded on Dr Wieland’s behalf showing him where to find summary information. Andrew B then provided more specific examples of supposed contradictions. Andrew Lamb’s second response asked for permission to publish, and meanwhile pointed out one principle answering alleged citation errors by the New Testament of the Old Testament. He also referred Andrew B. to a book as well as a detailed section on harmonization principles from Tekton Apologetics Ministries , which specializes in contextual defenses of the Bible and refuting critics of Christianity. Andrew B. allowed us to use this as a feedback, so we asked Tekton’s founder, James Patrick Holding, who has contributed a number of CMI articles before, to reply further . He explains the importance of understanding inerrancy properly, and how vital it is to understand the Bible according to the way its original readers would have understood it, rather than impose 21st century conventions upon it. We also have some editorial comments on Andrew B’s emails. We advise readers to study carefully the articles hyperlinked in the responses. Now, before I comment, I wish to say that I am on your side, regarding creation. I believe Jesus is God, and I believe that that the Biblical accounts are accurate. However, if you look closely at some of the parallel Biblical accounts, particularly the accounts of the very first Easter Sunday morning, then it would appear that the writings in Matthew’s Gospel, are completely different in some crucial areas, compared with the writings of the very first Easter Sunday in John’s Gospel, for example. If you wish, I could detail them for you. Now, I would very much like to believe that the Bible is infallible, (and by and large, I think that it is), but how then, do you reconcile the significant discrepancies between Matthew’s account, and John’s account, of the same one incident on Easter Sunday morning? Thank you for your email of 8 January, submitted via our website. I am replying on Carl’s behalf. We believe that the books of the Bible are inerrant in their original autographs (clause B1 in our Statement of Faith ) but we recognise that a tiny proportion of error may have crept in since they were first written. For example Dr Sarfati details what we think is a copyist error in our article ‘Cainan: How do you explain the difference between Luke 3:36 and Gen. 11:12?’ . However, differing accounts of the same event do not necessarily constitute contradictions. For an explanation of this, see the section ‘Contradiction’ in ‘Loving God with all your mind: logic and creation’ . 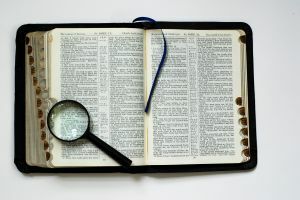 There are a number of superficial or ‘apparent’ internal inconsistencies within the Bible (and sceptics love to ‘play them up’) but most such inconsistencies quickly resolve themselves on careful study. Thank you for your prompt reply. I hear what you are saying, however, perhaps you may not be hearing exactly what I am saying. Firstly, let me say, that I am very much a creationist at heart. I teach Scripture in a number of schools, and every year, I take all of my Scripture classes on a slight detour to look at the creation vs. evolution topic. I enjoy seeing their little eyes light up, when they realise that the Bible does indeed have all the answers, and that the evolution argument, lacks both evidence AND commonsense! Now, back to the main point of my original email: Does the Bible contain human error? (CMI newsletter Jan–Mar 2007 by Carl Wieland) Carl Wieland appears to be saying, ‘No’. Ed. Note: It is worth clarifying the wording here. Our claim of inerrancy means that there is no error in what the Bible is teaching, and that the Bible never affirms human error. This is presumably what Andrew B disagrees with. Not everything reported in the Bible is endorsed by the Bible. However, to clarify for readers, with respect to the word ‘contains’, we have pointed out before that not everything reported in the Bible is endorsed by the Bible. The Bible is full of reports of the failings of its heroes, which is a contrast to much ancient literature (and where there are no failings, as with Jesus Christ, the Bible reports erroneous accusations). The Bible also reports erroneous statements, such as the fool saying there is no God (Psalm 14:1) and Job’s wife telling him to curse God and die (Job 2:9), and reports evil actions. So in this sense, one can say that the Bible ‘contains’ error, but we would also be very careful to make it clear just what we mean by that (i.e. we don’t mean that there is any historical or teaching error in the Bible). However, my reading of the Bible, leads me to the opposite answer, ‘Yes!’ There are a number of places, where there may be some errors in the Biblical writings. For example, Matthew 27:9, ‘Then what was spoken by Jeremiah the prophet was fulfilled: They took the 30 silver coins...’ Actually, the prophet who prophesied the payment of the 30 silver coins, was not Jeremiah, but rather Zechariah! So, there is one error — though it is a very minor error, and the error has no bearing on the meaning of the passage, but none the less, it is an error. It is written in Isaiah the prophet: ‘I will send my messenger ahead of you, who will prepare your way’ — ‘a voice of one calling in the desert, ‘Prepare the way for the Lord, make straight paths for him.’ And so John came, baptizing in the desert region and preaching a baptism of repentance for the forgiveness of sins. However, the first quotation (v. 2) comes from Malachi 3:1, and only the second quotation is from Isaiah 40:3. Is this an error? By no means! The Jews often kept all the Prophets on a single scroll, and so would often cite the most prominent of the prophets. Later gentile scribes failed to realize this, and ‘corrected’ the text to ‘As it is written in the prophets’. But there is no error in following the citation conventions of the day rather than 21st-century practices, as various bibliosceptics unreasonably demand. Here, most of this was from Zechariah 11:12–13, and only a small allusion to Jeremiah 18:1–4 and 19:1–3, and the field mentioned in Jeremiah 32:6-9. Once more, some scribes tried to ‘correct’ this, but far fewer manuscripts have this ‘correction’ than the previous one. J.P. Holding explains more below , and links to articles with much more depth. The fate of Judas also appears to differ in Matthew (27:5), compared with Acts (1:18). Now, let’s look at what appear to be more errors, regarding the very first Easter Sunday accounts. * Matthew’s gospel: Women went to tomb. Angel of God rolled the stone away, and then sat on it. Guards were filled with fear. Angel spoke to the women. Women left the tomb, and ran to tell the disciples. Before the women met with the disciples, Jesus appeared to the women. Jesus instructed the women, to tell the disciples to meet Him in Galilee. The 11 disciples went to Galilee, to a particular mountain location. The disciples saw Jesus — but some doubted. (suggests it was the first time they saw Him alive). * Mark’s gospel: (1-8) Women went to tomb. Tomb was already open. As they entered the tomb, an angel appeared, and spoke to the women. The angel told the women to tell the disciples to go to Galilee, to meet the risen Jesus. * Luke’s gospel: Women went to tomb. Tomb was already open. Angels appear. Women leave the tomb, and travel to the disciples. Jesus appears to two of His followers, on the road to Emmaus (11 km from Jerusalem). These two followers, returned immediately to Jerusalem. Jesus then appeared to the disciples (in Jerusalem). * John’s gospel: Mary went to tomb (with other women probably). Tomb was already open. Mary (with others probably), left the tomb, and went to visit the disciples. Disciples went to the tomb, but did not see Jesus, so they returned to their homes. Mary stayed at the tomb, and angels appeared to her. Jesus then appeared to Mary. Mary went to the disciples and told them, ‘Jesus is alive!’ That evening (Sunday) Jesus appeared to the disciples (with the exception of Thomas) inside a house. Now then, these differing accounts raise some interesting questions. Personally, I am not interested in whether there was one angel, or two angels. I mean, the fact that some of the accounts mention just one angel, does not mean that there was not another angel there as well — as the second angel may not have had anything to say, and thus the one angel that spoke, was the one that was written about. Ed. Note: In this we agree. Rather, there are more significant ‘discrepancies’, when comparing Matthew’s account, with John’s account, for example. Matthew recorded that Jesus appeared to the women before the women met with the disciples. John recorded that Jesus appeared to Mary, after the women met the disciples. Matthew records that the disciples went to Galilee to see Jesus. John, does not record the meeting place, but it would be safe to assume it to be Jerusalem, which is consistent with Luke’s account, as it was the evening of that first day of the week — Sunday, and the disciples had visited the tomb on the Sunday morning — well, Peter and John had visited the tomb at least. Was Mary not with the other women (Matthew) when Jesus appeared to the women? For if she had been with them, then she would have told Simon Peter (John 20:2), ‘We went to the tomb, but Jesus’ body was gone, and on our way here to see you, Jesus appeared to us!’ However, instead, Mary said to Simon Peter, (John 20:2), ‘They have taken the Lord out of the tomb, and we don’t know where they have put him!’ It is not until John 20:18, that Mary indicates that she has seen Jesus alive. Do you get my drift here? I am not interested in punching holes in the Bible, but on the other hand, I am keenly interested in the truth of the matter. I have many visits from Jehovah’s Witnesses, and some people at my church call me a bit of an ‘expert’ on them, as I have done a lot of research on the JW movement, and it fascinates me to see the JWs deny reality, when I show them the many false prophecies that the Watchtower Bible and Tract Society has made over the years — Deut 18:20–22. Ed. Note: We agree about the JWs. See for example, How to talk creation with a Jehovah’s Witness and our articles on the Deity of Christ , which they deny. Anyway, likewise, I think we can end up looking like the JWs, if we pretend that the Biblical accounts are infallible (as Carl Wieland commented), as it would appear, that there are some major discrepancies with the Easter Sunday accounts, for example. Thank your for your further email. We feel the issue and examples you raise, and our response to them, could have teaching value for others. If you are prepared to give us permission to publish your two emails of 8 and 11 January on our website, then we will prepare a detailed response. If this is okay with you, could you please let us know your street address? We would not publish this; it is merely our standard means for verifying the bona fides of contributors. We would publish your first name and initial, not your full name. In the meantime, I recommend to you the harmonization section on the Tektonics apologetics website and the attached section on the resurrection from The Life of Christ in Stereo . Also, I understand that in ancient times a scroll and its contents were generally referred to by the name of the major author, even when the contents were by several authors. Sure. I am not after any publicity for myself. It is unfortunate that Andrew B. has seemingly accepted so readily charges of Biblical error and contradiction, especially given the unfortunate fact that those he lists are standard canards for which scholarly refutations have existed for decades, or in some cases, centuries. His citation of Matthew 27:9, for example is readily resolved either by recognizing in it the Jewish practice of compound citation (see http://www.tektonics.org/lp/mkone2.html ) or of theme fulfillment (see http://www.tektonics.org/af/berryr01.html , item #34). His allegation regarding the death of Judas is similarly resolved by the application of Jewish exegetical technique (see http://www.tektonics.org/gk/judasdeath.html ). Similar ‘errors’ are found in modern works by competent historians, and no one calls these ‘errors’. Understanding the roles played by editorial freedom in ancient writings, and such concepts as dischronologized narrative (that is, an author purposely reporting events out of chronological order, for some reason such as a thematic one — which has particular relevance to some of the examples Andrew B. cited) is critical to understanding why variations among the Gospels may not be regarded as errors simply because of the variations. Moreover, similar ‘errors’ are found in modern works by competent historians, and no one calls these ‘errors’. I would recommend either my own account, http://www.tektonics.org/qt/rezrvw.html , or John Wenham’s book Easter Enigma, should Andrew B. wish to check into the matter further. We thank JPH for his valuable assistance, and also thank Andrew B for giving us a chance to explain vital points. We also return to the theme of Dr Wieland’s article in the first place, that distrust of the Bible’s history has, even for many churchian leaders, led to distrust of the Bible’s soteriology and ethics . Does the Bible condone torture?